President Donald Trump is normally quick to complain about what he sees as unfair foreign competition. But when he met with U.S. airline CEOs Thursday morning at the White House, he signaled that he cannot help them fend off foreign airlines that are heavily subsidized by their governments. It's a big departure for the president who has made "America First" a centerpiece of his administration. The reason: The airlines in question, Emirates, Qatar Airways and Etihad Airways, buy lots of planes and jet engines from U.S. manufacturers like Boeing (BA), General Electric (GE) and United Technologies (UTX). And that supports thousands of well-paying factory jobs here at home. Trump said he knows that the airlines are "under pressure from a lot of foreign elements and foreign carriers." "At the same time we want to make life good for them also," he added. "They come with big investments. In many cases they're investments that are made by their governments. But they are still big investments." 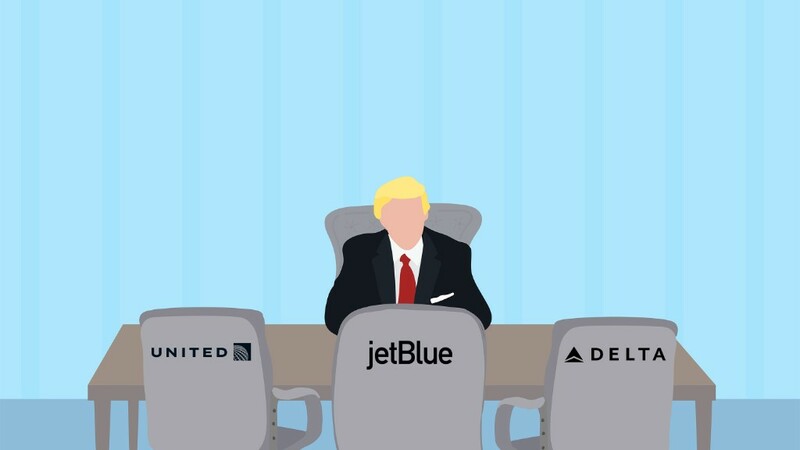 Trump met with the CEOs of United Continental (UAL), Delta Air Lines (DAL) and Southwest (LUV), as well as cargo carriers and officials from many of the nations' largest airports. Under the Open Skies Agreements that the U.S. has signed with foreign countries, three Middle Eastern airlines that get government support from Qatar and the United Arab Emirates have rapidly expanded their reach to U.S. destinations. The three biggest U.S. carriers -- American Airlines (AAL), Delta and United -- have loudly objected to the expansion, claiming the Middle Eastern airlines have unfairly benefited from national subsidies. U.S. airlines want the State Department to review the agreement that allows access to the U.S. airports. The U.S. airlines argue that the unfair competition puts some of their jobs at risk. Delta issued a statement after the meeting saying it planned to hire 25,000 workers over the next five years with "the support of a level playing field globally." It did not say how many of those hires would be new jobs and how many would replace current workers who retire or leave. At Thursday's meeting, Trump did promise that the U.S. would invest in transportation infrastructure, improving the nation's airports and air traffic control system. He blamed regulations for interfering with infrastructure upgrades. He also said that often the equipment that does get purchased is "obsolete the day they order it." He said his personal pilot, who is a "real expert" and a "smart guy who knows what is going on," told him the government had been buying the wrong equipment. "Airports are very important to me. Travel is very important to me," said Trump, who once ran an East Coast shuttle airline before it went into bankruptcy. He complained that U.S. airports used to be the best in the world, but that now they're on the bottom rung. "You go to China. You go to Japan, they have fast trains all over. I don't want to compete with your business, but we don't have one fast train," he said, prompting laughter in the room. The Federal Aviation Administration defended itself later Thursday, saying its "NextGen" air traffic modernization projects will produce $2.7 billion in savings to passengers and airlines and more than $160 billion through 2030. The agency called the effort "one of the most ambitious infrastructure and modernization projects in U.S. history." The airlines with executives at the meeting issued statements calling it a useful and productive session. Executives who were present told CNN they were impressed with Trump's knowledge of their industry. "He had done his homework and was well versed on the issues," said one executive. Another called him "an aviation aficionado." He reportedly asked a lot of questions of the executives, especially about the air traffic control system. During the portion of the meetings at which reporters were still in attendance, Trump complained that the government had spent billions of dollars on an air traffic control system that is "totally out of whack." He asked why airlines, which are on record wanting an overhaul of nation's air traffic control system, had "allowed" the government to invest in a faulty system. Southwest CEO Gary Kelly informed Trump that the airlines were "not in control" of those decisions. Trump also said three or four times, "We need to rebuild America's airports," according to another executive. He said he would come up with a way to pay for improvements, without giving any details. Airlines have objected to fees that passengers are forced to pay to cover the cost of improvements and security measures. Trump told the executives, "I don't like fees." -- CNNMoney's Jon Ostrower contributed to this report.